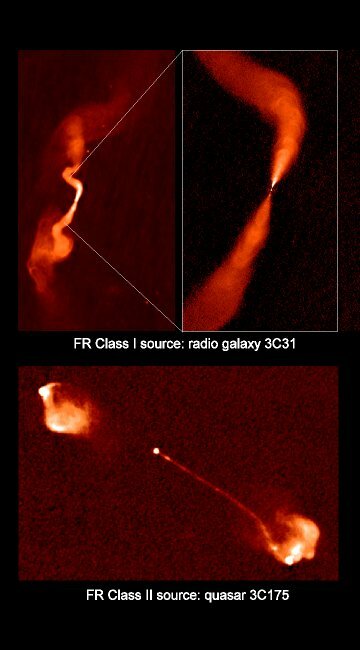 The VLA greatly accelerated the study of radio jets, for several reasons. It had the sensitivity to detect weak jets with short observations, the dynamic range to do so in the presence of bright unresolved emission in the galactic nuclei, and the angular resolution to separate the jets convincingly from surrounding extended structures. It also allowed polarization imaging with good sensitivity and resolution, and this revealed key details of the jets' magnetic configurations. Correlations between jet properties and the Fanaroff-Riley structure classes: The plume-like, low-luminosity, Fanaroff-Riley Class I sources (Fanaroff & Riley 1974) have two-sided, rapidly spreading and prominent jets (e.g., Figure 3). The "classical double", higher-luminosity, FRII sources have one-sided, narrowly-collimated jets that are more prominent in quasars than in radio galaxies (Bridle & Perley 1984). Correlations between kiloparsec and parsec scales: The brighter kiloparsec-scale (VLA) jet is always a plausible extension of the brighter parsec-scale (VLB) jet. The kiloparsec-scale jets are also well aligned with the parsec-scale jets in the FRI sources (Giovannini et al. 1995; Venturi et al. 1994, 1995), as exemplified by NGC315 in Figure 4, and in lobe-dominated FRII sources. The angular relationships are more complex in core-dominated sources whose jets appear more bent, but even in these sources the brighter large-scale jet is usually a plausible continuation of the brighter small-scale jet. Correlations between jet sidedness and depolarization asymmetry: In sources whose jets differ greatly in brightness, the brighter jet is on the side of the source that depolarizes less at long wavelengths (Laing 1988; Garrington et al. 1988, 1991; Parma et al. 1996). This is consistent with the brighter jet always being on the nearer side of the source. Correlations between magnetic field orientation and jet sidedness: well-resolved jets are often highly linearly polarized, so their magnetic fields are partially ordered -- one-sided jet features in FRII jets and at the bases of FRI jets are dominated by field components along the jet axes, but straight FRI jets are dominated by perpendicular field components further from the AGN (Bridle 1984). and a Class II source (3C175: 4.9 GHz, 0.35" FWHM). Figure 4: The correlated sidedness and good alignment of the kiloparsec-scale and parsec-scale jets in NGC315 (superposition kindly provided by W.D.Cotton). The gray scale image is from VLA B configuration data at 4885 MHz, the inset contour plot is from VLBA data at the same frequency. Jet modelers now had some clear observational correlations to explain. Much early debate centered on their implications for jet velocities. The bending of "head-tail" sources, many of which resolved into U-shaped twin jets, was modeled as an effect of the relative motion of the host galaxy and an intracluster medium: their symmetries in the presence of the bending argued for subrelativistic velocities and moderate Mach numbers (O'Dea 1985). The excellent collimation of jets in FRII sources suggested low jet densities and high Mach numbers (Payne & Cohn 1985; Williams 1991). The brightness asymmetries of FRII jets on many-kiloparsec scales encouraged the idea that their bulk velocities stay relativistic, like those of their one-sided and often superluminally-moving parsec-scale counterparts, even on these large scales. The models had their roots in early papers by Morrison (1969), who outlined a pulsar-like model for an AGN emitting a continuous relativistic beam, and by Rees (1971), who suggested that the sources were powered by low-frequency electromagnetic beams. Longair et al. (1973) argued for an energy transport time scale "comparable with the age of the source" and Scheuer (1974) explored the dynamics of radio sources powered by relativistic beams. Blandford & Rees (1974) suggested a "twin-exhaust" collimation mechanism for relativistic plasma flows (on 100-pc scales).